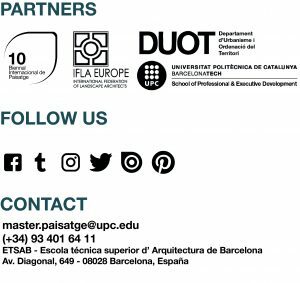 NEWSLETTER – Master in Landscape Architecture Barcelona – Universitat Politècnica de Catalunya – 35ª EDITION. Do you want to know everything about our master’s degree program? Come to our informative sessions of our master’s degree programs and the modular offer. The next 12 of JULY at 6.30 pm at the Tech Talent Center: carrer Badajoz 73, Barcelona. PROJECT THE SECOND COAST. TOURSCAPE. Next March 6 our postgraduate THE WATER SYSTEMS course will start. Especially in regions such as the Mediterranean area, coastal systems and riversides are part of the more specific landscape area. In this field, projects such as boardwalks, riverfronts, wetlands and etc are focused on the improvement of damaged territory….